Posted on May 16, 2017 by staceyanderton1	in Features and tagged cancer run, oncology, Saegertown Cross Country. For the tenth straight year, the Saegertown Cross Country team will hold the Out-Run Cancer Run in June to benefit cancer research. The previous location for the run was Woodcock Dam, but this year’s event will be held on the track of Canon Memorial field at Saegertown High School on Sunday, June 4 from 8 a.m. until noon. Anyone can participate, and National Honor Society members will receive service hours for participation. “For the last 10 years proceeds have been divided in half, benefitting the cross country team and breast cancer research. This year we have chosen to go a different route and give half the proceeds to the Yolanda G. Barco Oncology Center Benevolent Fund, and the other half will go to the cross country team,” said head cross country coach Bill Hetrick. Sponsor forms are available in room 226. Some snacks and drinks will be provided, but plan on bringing your own as well. Senior cross country captain Ben Haylett will be DJing, playing tunes to keep you moving. You must have your sponsor sheet with you so mileage and money owed can be verified. Plan on arriving at least 15 minutes early for instructions. This is a rain or shine event. Any questions, email Mr. Hetrick at whetrick26@gmail.com. Posted on November 17, 2014 by staceyanderton1	in Sports and tagged Saegertown Cross Country. 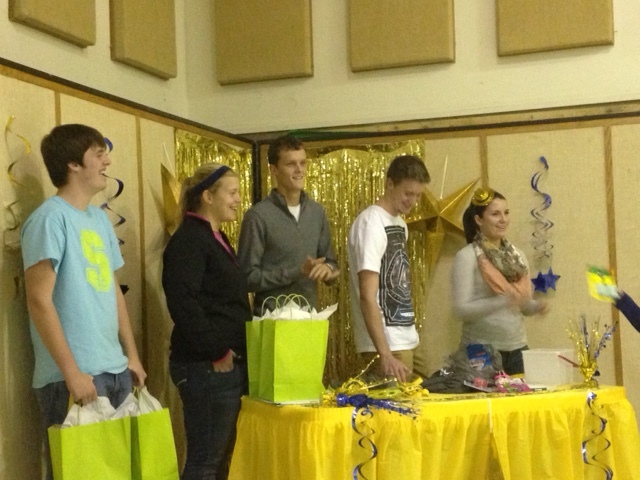 Saegertown cross country seniors: from left Tucker Geer, Jessica Tomiczek, Brendon Barclay, Chris Guy and Rachel Smith presented gifts to the underclassmen at the banquet on Nov. 11. Junior Brad Amy paced three Saegertown Cross Country runners at the PIAA State Championships on Nov. 1 in Hershey, Pa. The race took place at Parkview, which used to be a golf course. Amy finished 24th overall. Senior Brendon Barclay and freshman Beka McClymonds also had good showings at States placing 57th and 59th respectively. “It felt amazing beating my previous time from last year at states, but I felt terrible knowing that I would never get to race with Brendon and the other seniors again,” said Amy. The Cross Country team held their banquet November 11 at Pleasant View Alliance Church. Junior Garrett Johnston said, “I really appreciated what the coaches had to say about the team and our season.” The season may not have ended on the high of last year’s state championship, but the team will still carry its seven year 58-0 undefeated Region 3 record into next year.